It reads like a movie script - ash falling from the sky, thick smoke shutting down airports and businesses, road closures trapping remote northern villages. But this is not from a script; rather, it is a University of Guelph-led study of what could happen through peat burning. In an international paper released in the January edition of the journal Nature Geoscience, the researchers, led by University of Guelph Integrative Biology professor Merritt Turetsky, focus on fires that burn through thick layers of peat (dead plant debris) that blanket the ground in ecosystems ranging from the tropics to the arctic. Peat is a legacy of plant activity - plants acquiring carbon from the atmosphere to build their biomass. Those plants die and are incorporated into the soil. When those soils are too wet to support high levels of decomposition, those plant remains pile up over time. "When people picture a forest fire, they probably think of flames licking up into tree tops, and animals trying to escape," said Turetsky. "But peat fires tend to be creeping ground fires. They can burn for days and weeks, even under relatively wet conditions. They lack the drama of flames, but they produce a lot of smoke." That smoke makes peat fires dangerous to human health. It can worsen air quality and even trigger asthma and other respiratory problems. "We know fires serve as a major source of human mortality globally," said Turetsky. "We are starting to understand that peat fires cause some of the most extreme air quality issues, but in general they are poorly understood." Turetsky and former University of Guelph post-doctoral researcher Brian Benscoter teamed up with temperate and tropical fire scientists to summarize what is known about peat fires, from massive lightning-ignited fires that burn large areas of the boreal region to tropical fires often triggered by human activity. "The tropical peatlands in Southeast Asia are a clear demonstration of how human activity can alter the natural relationships between ecosystems and fire," said Susan Page, a University of Leicester professor and co-author on this study. "Tropical peatlands are highly resistant to natural fires, but in recent decades, humans have drained peatlands for plantation agriculture. People cause the deep layers of peat to dry out, and also greatly increase the number of fire ignitions. It's a double threat." This causes a host of problems, including health issues, airport and school closures, and political tensions. The paper concludes that almost all peat-rich regions will become more susceptible to drying and burning with a changing climate. "Thanks to satellite data, we are fully aware of the vast scale of burning in drained peatlands, mostly in Indonesia," said co-author Guido van der Werf, a professor at Amsterdam's VU University. "The scary thing is future climate change may actually do the same thing: dry out peatlands. If peatlands become more vulnerable to fire worldwide, this will exacerbate climate change in an unending loop." Peatlands store a large amount of carbon due to thousands of years of plant activity. When peat burns, carbon is released into the atmosphere. "Smouldering peat fires already are the largest fires on Earth in terms of their carbon footprint," said Prof. Guillermo Rein, Imperial College London. Peat fires and their effects will only increase as more towns are built and more resources developed near peat-rich regions, said Turetsky. "These types of fires have different impacts on ecosystems, and traditional fire management techniques will not be effective in combating peat fires. We need new tools to deal with these issues," she said. 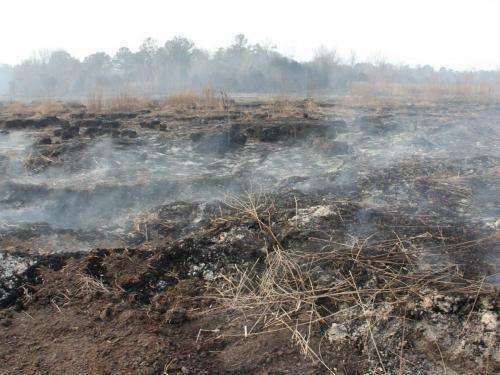 The study is titled "Global vulnerability of peatlands to fire and carbon loss." On the up side, the world would smell like single malt scotch.
" "The scary thing is future climate change may actually do the same thing: dry out peatlands. If peatlands become more vulnerable to fire worldwide, this will exacerbate climate change in an unending loop." "
There is absolutely no empirical proof that there is less rain now than in the past. "May" and "Could" are the operatives here. Anyone that calls this a real science is just a political hack. "There is absolutely no empirical proof that there is less rain now than in the past." Perhaps you are unaware of the geological record. I can't speak to your claimed lack of proof, but regarding climate change: Climate changes. Weather patterns shift. More rain falls here, less there. There used to be bogs there. Try to be more insightful. During a longish drought, peat fires burned for years in the swamps of central Florida. Caused some really bad fogs (fog by itself was bad, smoke by itself was bad, combined the two were impenetrable). Drought ended, fires extinguished. Notice: The world didn't end.